In what has been an unorthodox stage race for a variety of reasons, the Tour of Poland also challenges teams by allowing just six riders per squad, even in a seven-day stage race with nearly 200-kilometre stages. For this reason, even in spite of giving up the overall lead, Euskaltel-Euskadi was pleased with the defense it put up in support of Jon Izaguirre during Friday’s stage five. Izaguirre is one of nine or ten riders who have a chance to take the overall victory after Saturday’s final time trial, as the Basque rider currently sits second overall. Christophe Riblon (AG2R La Mondiale) attacked into the yellow jersey in the finale of stage five, to go 19 seconds ahead of Izaguirre with a rolling 37km time trial still to race. Former race leader Rafal Majka (Saxo-Tinkoff) is third at 20 seconds, Sergio Henao (Sky Procycling) is 24 seconds back, and Pieter Weening (Orica-GreenEdge) is a further three seconds behind the Colombian. With 192 kilometres and ten categorized climbs on the menu on Friday, Euskaltel-Euskadi was faced with a very difficult task in defending Izaguirre’s yellow jersey. A big breakaway didn’t help matters, though they got periodic help from Saxo-Tinkoff and Cannondale. With many riders deciding to save energy by dropping back, the peloton was noticeably small heading toward the finish. 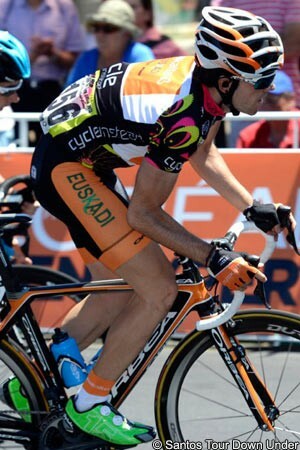 Though they were unable to completely contain Riblon, Euskaltel-Euskadi manager Gorka Gerrikagoitia recalled the day fondly. Izaguirre let Riblon go when he accelerated out of the leader’s group, in which the Basque rider was isolated. He did eventually work to close down most of his gap, but Riblon went away again with eventual stage winner Darwin Atapuma (Colombia). The gently rolling 37km time trial is left to settle things on Saturday, and Gerrikagoitia is confident in his rider’s abilities. If it is an Izaguirre versus Riblon battle, the Basque rider should have the upper hand. Izaguirre has beaten the Frenchman handily in time trials this season in the Vuelta al Pais Vasco, the Tour de Suisse, and the Tour de France. In the stage 17 uphill time trial to Chorges in the Tour, Izaguirre was 14th. But looking to come from a little further behind will be Majka, Henao, and Weening. All three faced off in the Giro d’Italia in May of this year, with the little Colombian Henao putting up the kinds of performances that could make him the favourite to win the overall on Saturday. But with the time trial course flattening out for its second half, the win will go to the rider who has conserved the most power over the past two grueling stages.